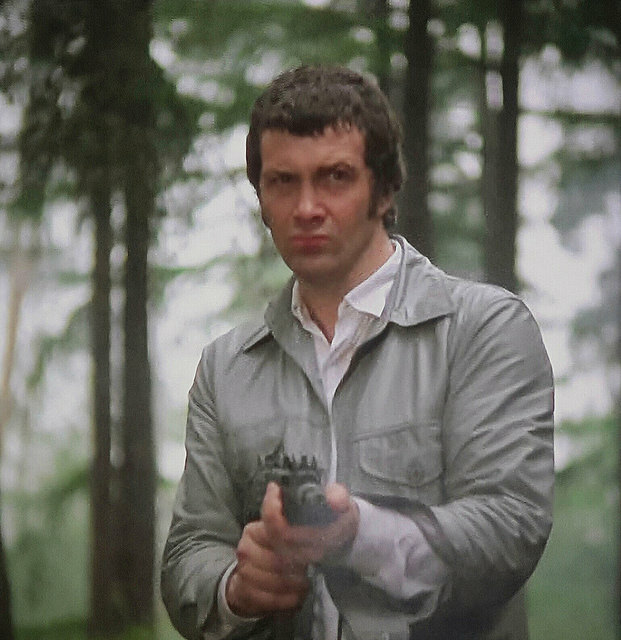 #439........"LEWIS COLLINS" - BODIE 3.7 . you'll never walk alone ! me too , such intensity and look at that determination, definitely an enjoyable scene. Plus the lip, skin tone, grey jacket and green background. ooooh yes all of the above mentioned, i know it's been mentioned before about his grey leather jacket but i love it and yes there is so much to admire. btw i have just got to mention this dream that i had of the lads last night. It's all as clear as day. The lads were on a undercover assignment at a fun fair , stopping some drug dealers and Doyle was visiting the fair while Bodie was operating one of the rides, the waltzer i think. He looked so good in ripped jeans and a dirty t shirt underneath a black bomber jacket, greased up with oil. I could tell you exactly what they looked like and exactly what was said. Pitty i am not good at writing fic because this was a vision of gorgeousness and i didn't want to wake up *g*. there is nothing quite like a Bodie in full flow.